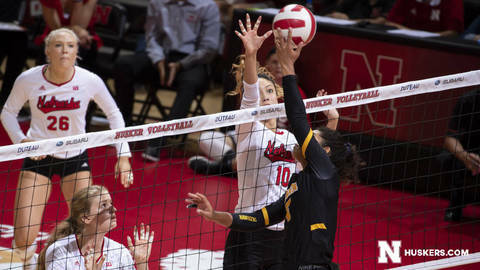 The sixth-ranked Nebraska volleyball team began its stretch of four straight road matches with a sweep of Iowa at Carver-Hawkeye Arena on Wednesday night. The Huskers improved to 29-0 all-time against Iowa with a 25-15, 25-22, 25-13 win. Nebraska (19-6, 10-5 Big Ten) posted its third straight win behind 12 kills from Lexi Sun, who hit .400 for the match and also added 11 digs. Sun was particularly huge for the Big Red in set two, terminating four straight kills to help the Huskers rally from down 19-14 to win the set. Mikaela Foecke added 13 kills on .344 hitting with eight digs and three blocks playing in her home state. Foecke became the eighth Husker in school history to reach 1,500 career kills with her first kill of the match. The Huskers were sharp offensively for the second straight match, hitting .333 after hitting .427 against Rutgers on Saturday. Nebraska had just eight attacking errors for the match, its fewest in a Big Ten match this season. NU held Iowa to a .070 hitting percentage, its lowest mark of the season. Lauren Stivrins had seven kills and four blocks, and Jazz Sweet had five kills with three blocks. NU had a 6-1 advantage in blocks, a 53-45 edge in digs and 6-4 advantage in aces. Sun served two aces, while Nicklin Hames led the team with 17 digs to go with 30 assists for her 11th straight double-double. Kenzie Maloney chipped in eight digs and five set assists. Reghan Coyle had 11 kills for Iowa (13-13, 5-10 Big Ten). Set 1: Sun had a kill and an ace to help the Huskers take a 5-2 lead. But Iowa responded with a 7-3 run to go up 9-8. Sweet and Schwarzenbach put the Huskers back in front briefly, 11-10, with a block, but Iowa went back up 12-11 with an ace. Sweet and Schwarzenbach teamed up again for a block and denied a number of Iowa attacks on the next rally to spark the Huskers to a 14-12 lead. Foecke added three more kills and Stivrins combined on two blocks before Maloney served an ace to put the Huskers up 20-13 with a 9-1 run. Sun, Foecke and Stivrins added kills down the stretch, and Megan Miller tacked on an ace as the Huskers won 25-15. NU hit .315 and held Iowa to .022. Set 2: Back-to-back kills by Foecke and Sun got NU off to a 7-5 start. Iowa ran off four straight points, including two aces, to take an 11-9 lead. The Hawkeyes led 17-12 via a 5-0 run after Nebraska had tied it 12-12. Foecke ended the run with a kill and an Iowa hitting error cut the deficit to three, 17-14. A pair of Iowa hitting errors and an ace by Foecke pulled NU within one at 19-18. After an Iowa kill, Sun terminated four straight rallies as part of a 5-0 run that put the Huskers ahead 23-20. NU earned set point at 24-21 after an Iowa service error, and the Huskers won 25-22 after Sun’s seventh kill of the set. The Huskers closed out the set win on an 11-3 run after trailing 19-14. Set 3: Schwarzenbach tallied a kill and Stivrins blocked two shots, one with Foecke and one with Sweet, as the Huskers went up 5-2. Foecke, Hames and Stivrins killed three straight rallies to boost the Huskers to a 9-4 lead, and NU extended the lead to 15-7 with two more kills by Sun and an ace by Hames. Foecke and Schwarzenbach teamed up for a block, and Sweet pounded a kill for a 19-8 Husker advantage. The Huskers closed out their 19th sweep in the last 20 matches against the Hawkeyes with a 25-13 win. Iowa hit -.100 in the final set. Up Next: The Huskers are back on the road at No. 15 Michigan on Saturday at 6 p.m. (CT).